LOCK IN! Last day of school! Now registering for Summer Skatecamp! Game of SKATE! 2 divisions: 18 and up and under 18. One winner each division. Sign up at the park! Now registering for Spring Break Skatecamp! Video edit from our One Year Anniversary Demo and Signing with Tafari Whitter Karl Watson and Lil' Dre! Thank you so much to Andrew Andersonfor this awesome edit! And thank you to Tafari, Karl, and Dre for making our one year anniversary so special, and thank you to everyone who has supported us through our first year! Best Trick Contest POSTPONED until October 1st. Mandy, Paul and the rest of the HFL crew are stranded down south due to Hurricane Irma so we've had to move the contest. Stay safe everyone and see you October 1st! ANNOUNCING! Cancer Benefit \\\BEST TRICK CONTEST/// Sunday September 10th Presented By: Alien Workshop, Flipside Boardshop, Octopus Garden, Payne Skatepark, Department of Transitions, Drifter Skateboard Manufacturing, Compound Boardshop, and Asylum Skateshop. Congratulations to Spencer Barton for winning the Game of SKATE yesterday! The competition was stiff, but Spencer was able to seal the deal with a switch 360 flip revert. Nicely done Spencer! \\\\Game of SKATE//// Sunday August 13th 6pm $5 Entry Fee--2 Divisions 18 and Up and Under 18--One winner each division. Sign up at the park. No better way to celebrate Go Skate Day this Wednesday than a session at the park! Wednesday June 21 only--members skate free and non-members pay just $5! RAD Skatecamp will be going down all Summer long! Head over to the Skatecamp page to sign up. Spring Break Yo' Self Contest went OFF yesterday with the best local skaters throwing down hard to claim the top prizes. Congratulations to Jared Lee, Chandler Davis, and Keanu Brown for taking the top spots! And a HUGE thank you to our awesome sponsors for making it all possible Flipside Boardshop, Zumiez, 12 Bones, Tops for Shoes, Wedge Brewery, Survival Pride Clothing, Diamond Thieves, and Air and Street. Let's do it again next year! Concert at the park! Saturday April 15th some of the area's best DJs will be spinning courtesy of BEAT LIFE. Free to attend with donations to BEAT LIFE encouraged. Come listen to some beats and watch the skating! Old Man Nite! First Sunday of every month 6pm-10pm, 25 and up. Come out to our first one April 2nd! Announcing our Spring Break Yo' Self Best Trick Contest! Three events: out ledge, six stair rail and hubba, eight stair rail and hubba. Three different winners! We've got tons of prizes to give away thanks to our great sponsors: Wedge Brewery, Flipside Boardshop, Diamond Thieves, Tops for Shoes, Zumiez, 12 Bones, and Air and Street. Come get you some! Proudly introducing the RAD Skatepark team: Keanu Brown, Trayvon Sams, DJ Garnett, Ram Ramirez, and Kevin Shelton. Welcome to the team guys! Thanks to Clark Hodgin for filming and editing. YouTuber Ty Moss has been skating the park. He put together this solid video review with some great skating. Thanks Ty! Here's an edit of some of the skating that went down at our grand opening party. Jared Lee, Keanu Brown, Ram Ramirez, and Addison Hess (amongst others) broke the park in nice! Big thanks to Clark Hodgin for the filming and the edit. November 28, 2016 Grand Opening Announcement! We are so excited to announce our grand opening! See you Saturday December 10th at 10am! Also check out this cool lobby art by Subject 0mega. September 16, 2016 The course is all finished! Looks and skates great. Chad Roy and his crew did an amazing job. We've still got some work to do on the building before we can open though. Looks like it will be early November. August 24, 2016 Construction continues! Framing for most of the ramps is in place, and the welders have installed all the rails. It's really coming together! August 13, 2016 Construction of the course has begun! Sprucin' up the neighborhood this weekend with some really good artwork from local artists. Big thanks to Gus Cutty, Jon Graham, Ian Wilkinson, and all the other awesome artists who were a part of this great weekend! May 18, 2016 Here we go! Interior walls are down. The owners of the building are now doing their portion of the renovations. 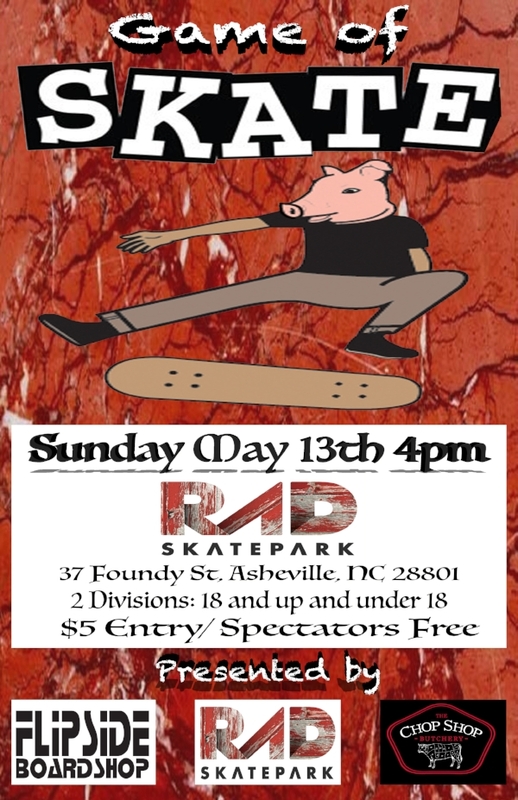 In August, Chad Roy and his crew from New York will be heading down to Asheville to build the park. Construction of the park will take about a month, and we hope to be open in the fall.